I have absolutely zero pictures from yesterday and as I left my camera on the kitchen counter! But I just had to share the appt I brought to our friend's place! If I do say so myself, it was a hit! SPREAD cream cheese onto bottom of shallow bowl or 9-inch pie plate. 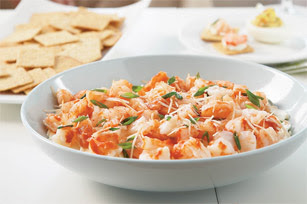 Toss shrimp with cocktail sauce; spoon over cream cheese. SPRINKLE with Parmesan cheese and onions. SERVE with WHEAT THINS Crackers. I served them with All Bran Garlic & Herb crackers. YUM! Shrimp & cream cheese-my faves. How could it NOT be good? !